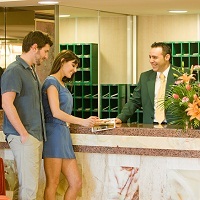 Making a reservation in a hotel or any other accommodation is a task that can puzzle the mind. There are numerous hotel-booking apps that show various prices of the hotels with the similar amenities. This usually gives slight jerks to the vacation budget. In order to avoid this, you can contact us. We operate from Ludhiana (Punjab, India) and have a professional tie-up with the leading hoteliers in India. We can book the 5-star, 3-star, 2-star, guest house, luxury resorts, and motels all over India. Avail this service of ours today.